CM Magazine: Franklin's Day With Dad. (Franklin and Friends). Franklin's Day With Dad. (Franklin and Friends). Just then he saw Fox walking by with his dad. "Hi Franklin," said Fox. "I thought you were having your Day with Day today?" "I will be," said Franklin, "once my dad finishes helping everyone." "We're helping everyone too!" said Fox. "We've been collecting all their old junk." "So when are you going to do your Day with Dad stuff?" Franklin asked. "We are doing it," said Mr. Fox. "It doesn't matter what we do, as long as we're together." "Hmmm," said Franklin. "Then I'd better get back to my dad!" 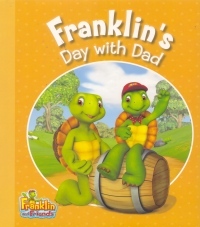 A special day with Dad sounds like a great idea to Franklin. He imagines spending the day fishing, playing games and flying a kite. Although Mr. Turtle agrees that it is a great idea, he runs into problem after problem that prevents him from doing what Franklin has in mind. Franklin waits patiently while his dad fixes a rain barrel, helps Mr. Mole hang a sign and fixes Mr. Groundhog's leaky roof. With each new job Mr. Turtle takes on, Franklin loses hope that he will get to do anything special with his dad. When he runs into Fox and his dad, Franklin expresses his disappointment to Fox. To his surprise, Franklin learns that Fox is spending his special day just being with his dad while he goes about his regular jobs. This is when Franklin realizes that what makes the day special is not the special activities he had planned but just having the opportunity to spend the entire day with his father. Themes of family and community combine to make this Franklin story especially endearing. 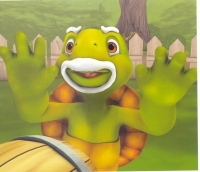 Franklin's father is an excellent role model, selflessly helping all his neighbours with their problems. Franklin learns that this is part of what makes his dad so special. The illustrations in this book consist of both large pictures of the different scenes and small ones showing how Franklin's feelings change as the story progresses. There is enough detail in the large illustrations that young children can retell the story just by looking at the pictures. The close-ups of Franklin provide opportunities to discuss Franklin's feelings. Though I've read dozens of Franklin stories over the years, this one quickly stands out as a favourite because of its simple, yet important, message.